What's making venture capitalists nervous? Hedge funds. As startups take longer to go public, investors with deeper pockets -- like hedge funds and mutual funds -- are playing a bigger role in their funding. But high valuations come with higher expectations for rapid growth. Historically, VC firms have invested in both early- and late-stage startups. But as hedge funds are increasingly involved in funding late-stage firms, many VCs have been shifting to invest in early-stage, more underdeveloped, startups. And that's riskier -- both for startups and VCs. It's a likely reason that VC confidence in Silicon Valley is taking a hit. It's down for the first time in two years, according to the quarterly confidence index by Mark V. Cannice of the University of San Francisco. "Confidence tends to be closely tied to their ability to take a portfolio firm to an IPO," Cannice said. Venky Ganesan of VC firm Menlo Ventures, who participated in the survey, said that while he's more bullish than ever on startups, he believes hedge funds are driving feelings of uncertainty among his VC cohorts. Venture capitalists play a more active role in helping companies in their portfolio build sustainable businesses. 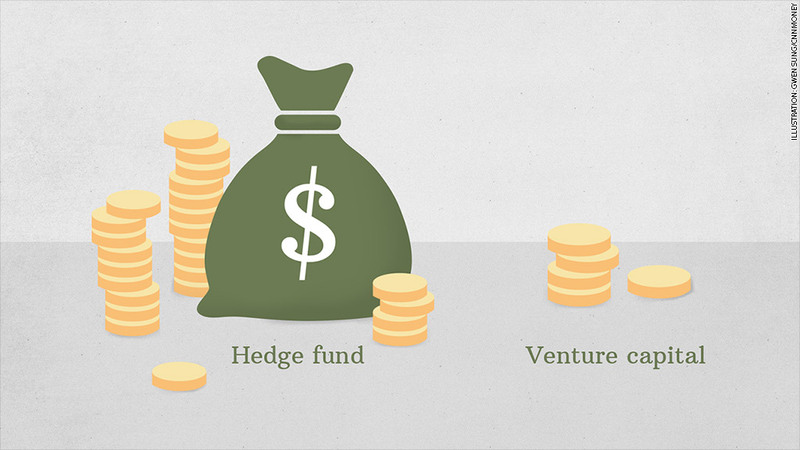 "[Hedge funds aren't] here to build companies," said Venky Ganesan of VC firm Menlo Ventures. "They're hoping someone else is going to buy from them at a higher price." But expectations of startup performance tend to be unrealistic, according to Steve Harrick, a general partner at VC firm Institutional Venture Partners. "You have companies trying to grow as quickly as they can, aggressively spending to capture market share," said Harrick. "Right now, the market is saying: We reward growth, we reward it at very high prices." Hedge funds and investment management funds have been increasing their startup investment in the last year, according to data from PrivCo. They've participated in 70 rounds this year, totaling $24 billion -- compared to last year's $8.6 billion. But there's no telling if startups will be able to generate returns for their investors -- and if hedge funds will keep pouring more money in, or pull out. "Venture capitalists marry their companies, hedge funds have one night stands. They're traders and we're builders," said Ganesan. "These are the tourists who will disappear when it goes from sunny to rainy. The residents? We'll stay."